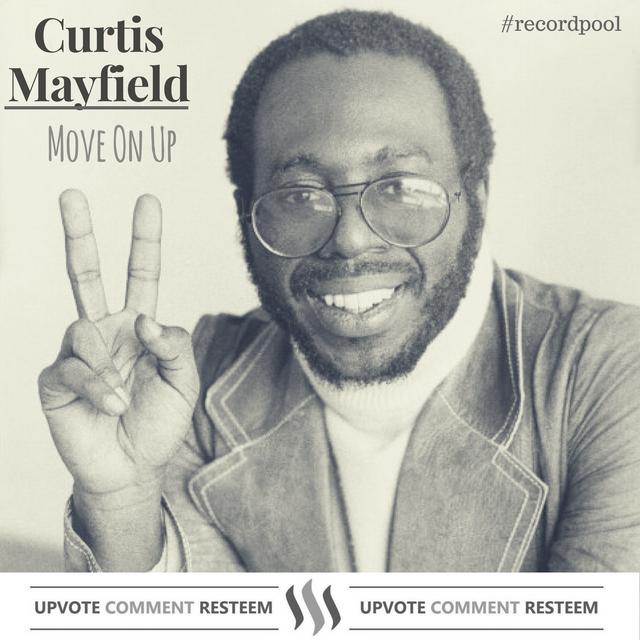 Steemit Record Pool | Song of The Day : The Legendary Curtis Mayfield with The Classic "Move On Up"
It's the Weekend in here! And what better then the Legend Curtis Mayfield with the classic gem "Move On Up" can lift your soul up and get you in that weekend mode. Also to add this track has been sampled by several Hip-Hop artists and one of my other favorite songs the hit by Kanye West - "Touch The Sky" featuring the Legendary HipHop artist and one of my favorite rappers Lupe Fiasco. Let's all keep that good vibes and positive energy flowing in this community, Build further and Keep on Move On Up. DJ Jazzy Jeff & MICK "Summertime Vol. 8 Mix"
Think You Got What it Takes to Join the Steemit Record Pool? @shaff.aff haha i know you love this. Thank you for playing it last night haha You inspired my today Record Pool Selection! Hi, I am from Indonesia love jazz music. It's great that you write here about famous jazz musicians. Thank.